Ethical, eco, sustainable, these are words that still conjure up images of earthy tones, rough fabrics, clothing that is far from luxurious. In our podcast with Cora Hilts from Reve En Vert we discussed how they tackled this brand perception issue and made luxury synonymous with sustainability. Simply put they don’t compromise for style for ethics. 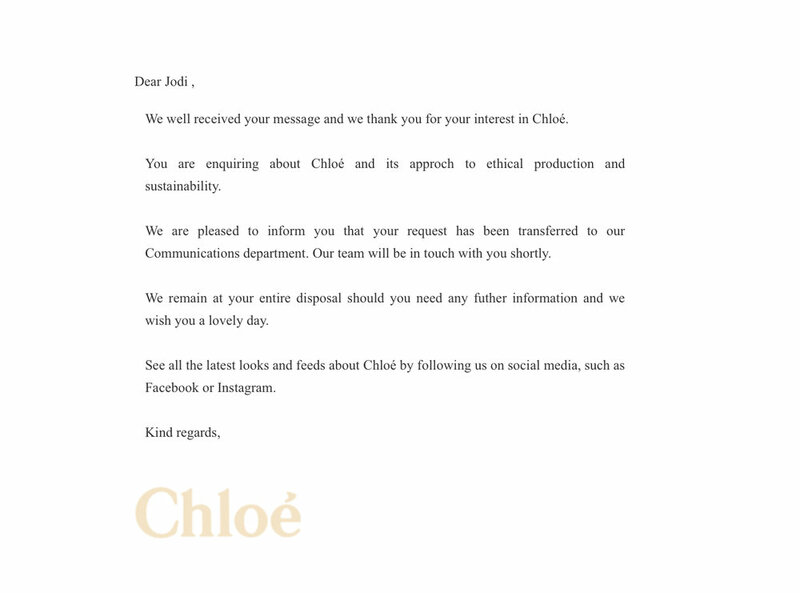 Why is it that some brand shout about being ethical or sustainable, and some are reluctant to say they are even if they are? If we say we are ethical, sustainable, eco conscious…. we hold ourselves accountable and open criticism. It takes time, money, and a lot of effort to really know your supply chain, from the beginning and to continually monitor production. Smaller brands are in a better place to know who makes their products, as they are often in the same country and have a personal relationship with the factory/makers. However they are also often pushed by sales margins to make items in factories they are not 100% happy with. If a brand looks to scaling up the next step is often outsourcing overseas, with budgets already constrained we are less likely to have a transparent supply chain and visit factories for ourselves. When a business become extremely large their product range becomes so vast creating a management problem in itself, also using many tiers of factories, which are notoriously difficult to keep track of. We can use third party auditing companies to keep up with compliance and workers conditions but this in the past has come under scrutiny for being manipulated and untruthful. So what’s the answer? As a brand we must hold ourselves accountable and work on creating a business built on strong ethics, a transparent supply chain and communicating that with our customers. As a consumer we must also realise the the journey to a completely transparent supply chain is often complex, and support brands to reach the goal of ethical, sustainable & transparent production. Negative headlines in the news raise awareness, which is essential, but in order to move forward we must support each other. Be open, be honest. Say I’m not perfect (there is no such thing!) but I’m working towards something better. Mainstream negative connotations are still associated with ethical, eco and sustainable fashion. It makes us think of people who have checked out of the fashion system - hemp wearing hippies, living in a 70’s vibe commune - and we disregard anything associated with this, let alone would ever consider it luxury fashion. So as a rule, lots of brands don’t associate themselves with this, and focus on another area of their business to position themselves within their market. Brands usually focus on one clear message, after all we are bombarded with information all the time, so let’s make that one message and make it loud and clear. Even brands like ABURY - who we have a great Q&A with Andrea Bury, CEO - focus on one message, preserving crafts, made by artisans. Alongside this ABURY accomplish many other things; ethically made, giving back through ABURY Foundation enabling education (social development, building water wells etc), cultural exchanges, creating fashionable luxury accessories. In the UK the Modern Slavery Act requires requires a commercial organisation over a certain size (a global turnover of over £36mn and carries on a business or any part of a business in any part of the UK definition) to publish a slavery and human trafficking statement each year which sets out the steps it has taken to ensure there is no slavery or trafficking in its supply chains or its own business, or states that it has taken no such steps. Which is a step in the right direction, but it’s not specifically fashion related or necessary for smaller organisations. There are organisations such as Fashion Revolution working toward making transparency visible to us all, by implementing ideas such as the Fashion Transparency Index and lobbying Government for 'greater transparency from the industry…underpinned by mandatory due diligence and regulations'. Often if we come across something that is being promoted as artisan, made by hand, made by craftsmen, we naturally associate these terms with ethical production. Items are unique, made by a person not a machine, using skills they have trained for years to learn, so therefore they must be getting paid a fair wage. However as we know just because something is labeled as something doesn’t mean it really is how we perceive it to be. We also know that some brands are just better at promoting their story and how they make things than others. In summary brands focus on a particular element of their business so they can reach customers who care about the same thing. There maybe lots of other parts to their story but focus is key. However a transparency statement online would help customers to know what they are buying. Customers and media need to support brands on their journey but also keep up the pressure to make the industry more transparent and improve the situation for workers globally, by getting involved at ground level with organisations like Fashion Revolution, and using our purchasing power to choose brands to support. Title image Chinti and Parker, who use the finest cottons, softest cashmere and lightest merinos, working with respected mills, the London based brand experiments with knit, whilst remaining loyal to luxury craftsmanship.